Ok, I've been playing this game for awhile and why this just donned on me I don't know. Maybe I had an epiphany. But, why is distance measured in kilometers and not nautical miles? And, why is speed measured in kilometers and not knots? Thanks in advance for any answers I might get. They might as well be noodles - rather than knots, MPH, or LM/HR. Watch your distance as you approach someone who is stopped... The distance is ticking down at .1 km/sec... OK.. That's 100 Meters PER SECOND.. Think about that - or better yet, convert that into 223.694 MPH. So the maps are scales a bit small (read outright cramped versus reality) I don't know the exact number, but if you divided the distances by around 10, it all makes sense.. except the gun range of a Yamato is 2 km.. Think Sandbox. If you really want an entertaining exercise, go into a training room with a 6" gun Mogami. 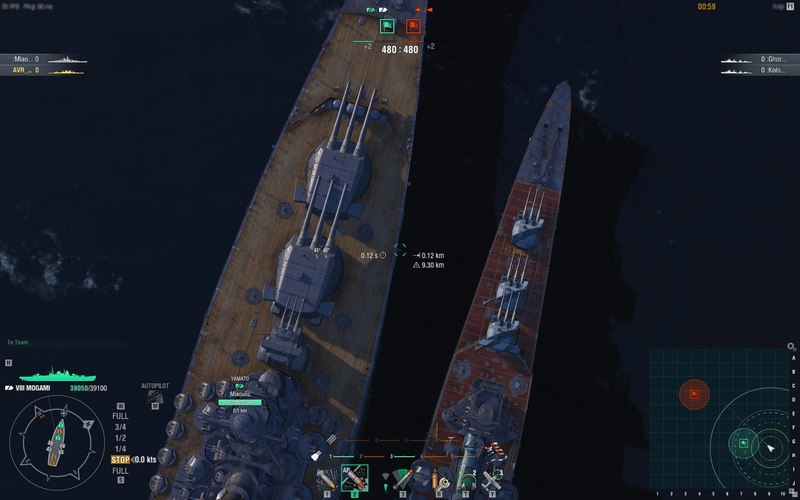 Bring up a Yamato as a friendly - and park the two ships next to each other. Those 6" turrets should be the exact same dimensions (because that IS what they are)... Then laugh and say, "It's just a game". Because most people don't have an idea of what a nautical mile, and so a knot, is. Also, it's pointless. Distances are compressed in game, so the speed and distance you're traveling isn't anywhere near realistic. Scaling is also different, so bringing your times and distances and trying to equate them to real world speeds is pointless. Might as well use a system most of the playerbase is familiar with. They are. The game’s camera FOV makes for an absolutely miserable comparator, as the insanity with the Murmansk and the Omaha revealed. If you take the actual ship models and remove perspective they match. Distance should be measured in Leagues. Speed should be measured in Leagues per Watch. 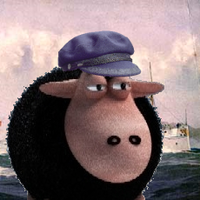 Just like in the Navy of the Grand Dutchy of Fenwick. It wouldn't take a genius to explain that a knot, is = to 60 seconds of the earth's rotation, or one minute of latitude. Now they have an idea, an idea that makes much more sense than any other measurement, for sailors. No. That would be a unit of length. The Nautical Mile. A Knot is a unit of speed; one nautical mile per hour. First, as Quaffer said, we're taking distance there, not speed. Second, What percentage of the playerbase do you think even knows what latitude is? I do, and since my background requires me to know spherical coordinates, I even know and can visualize what that measure is. While it certainly makes the most sense, I highly doubt the vast majority of players do know what it means, since most of them aren't sailors. It would just be an indecipherable system. The devs might not have even known what that was, so they stuck with the metric system. one minute of longtitude, is both distance and time, and so speed. Likewise, 1 nautical mile per hour, is both distance and time, which = speed. This is perhaps, why it needs explaining. WOWS players are capable off understanding far more complex principles, I am sure they can understand nautical miles per hour, and why they are preferred for marine (and airborne) navigation. one minute of latitude, is both distance and time, and so speed. Likewise, 1 nautical mile per hour, is both distance and time, which = speed. Yes, but they're only equivalent at a one particular speed, and the more common use is that of distance. And the fact that it needs explaining proves my point. If I need some explanation even with some understanding of the system used, it's not intuitive to the average player. heavens' do you use GPS? Google Maps? Do you understand what the coordinates refer to? Lat and Long, 60 second (and hourly) intervals of the earth's rotation. You use nautical miles (and nm/hours) every day, without realising it. A km or a mile or a foot or an inch is pretty easy to understand. If I have a piece of string this long, it's a foot. If I line up 5280 of those pieces, I have a mile. Straight line distance is pretty intuitive. And we can see it. As opposed to the spherical system, which obviously works a lot better on the globe, but can't be visualized as easily. You have to see the earth as a globe, then divide it into let's say 180 segments around the globe. The distance between the borders of those segments is your unit of measurement. While it might be easy for you and me to visualize it, it's easier to see the straight line distances. If I ask anyone outside the nautical community what the distance between the minutes of latitude is, they're going to look at me like I have 2 heads. Even if I explain it, about half of them aren't going to get it. As a chemist, I get to explain concepts which are dead simple and intuitive to me, but many other people just don't get it, not because they're stupid, but they're mind just doesn't work like that. People are brought up in miles and such, most Americans can't convert between the metric and standard systems. Asking someone to understand spherical geometry is a bit much, most kids don't care enough to understand algebra. But what it really comes down to is a lot of people just can't visualize things like that. They might be able to understand things that are incomprehensible to me, but our minds work differently, so they just don't look at things the way I do, and so can't quite understand where I'm coming from. Same applies here, most people can't visualize dividing a sphere up like that. Also, WOWS isn't played on a sphere, but a flat plane, so using a measure based off a sphere would require converting back to straight distances, so kind of silly really. I have never heard of latitude described as a speed. They are units of arc length. Kilometers are a function of meters, which were originally defined as a fraction of the arc length of the distance between the north pole and the equator. (I forget the number of meters, feel free to look it up.) So they have the same basis, just different number systems. Miles are metric too. A mile is 1000 Roman Paces. Longtitude is a marker of both time (60 second/hourly intervals), and distance (of the earth's rotation). Nautical miles, are not land miles. Two different things, many people confuse. A nautical mile is the distance between two longtitude markers. I can repeat this again if you like? edit : corrections, it is very late at my coordinates! no, I haven't a clue, but it is on wikipedia..
Looks fine to me. Yamato’s is elevated on a pedestal to clear the superfiring Yamato B turret. If you raised the C turret on Mogami that high it’d look the same.